Today, the Waakebiness-Bryce Institute for Indigenous Health (WBIIH), based at the Dalla Lana School of Public Health, is moving ahead expeditiously, led by a dynamic director, psychologist and academic Suzanne Stewart. Stewart is a member of the Yellowknife Dene First Nation and holds the Canada Research Chair in Aboriginal Homelessness and Life Transitions. In 2017, she left the Ontario Institute for Studies in Education (OISE), where she had been Associate Professor of Indigenous Healing in Clinical and Counselling Psychology, to take up her new role at the WBIIH. 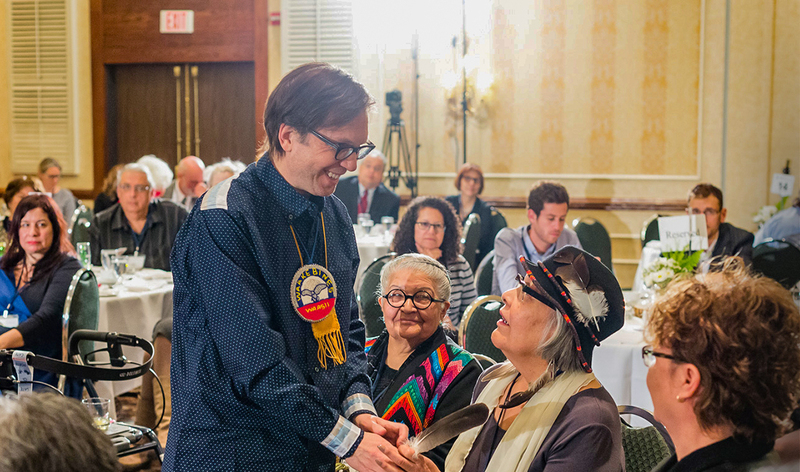 Two years later, the WBIIH has already attained an impressive list of achievements: a new master’s of public health degree program in Indigenous health, the launch of two international journals, and 22 ongoing research projects run by post-docs and graduate students—plus hosting an elder-in-residence and a program of regular cultural activities. But, the interdisciplinary projects that Stewart is most excited about are yet to come. In addition to serving one of Toronto’s most marginalized groups, the shelter laboratory will train students from five U of T divisions—the Dalla Lana School of Public Health, the Factor-Inwentash Faculty of Social Work, OISE, and the faculties of Medicine and Dentistry. Stewart and her colleagues are also working on launching a PhD program in Indigenous health, in partnership with two universities in Sydney, Australia and the University of Hawai’i.